Halloween is creeping up very soon! Portland dentists Dr. Todd Beck and Dr. Jacob Morrow at South Waterfront Dental encourage patients of all ages to manage candy wisely during this Halloween night. These tips can help you take care of your teeth. It’s not too late to prepare for a fun night of Trick or Treating, including choosing what you plan to hand out to those ghosts and ghouls who come by for treats. Take your kids shopping for alternatives to candy, including small toys like spider rings or temporary tattoos. If your kids insist on handing on candy as well, consider purchasing candy that contains xylitol. This natural sweetener that prevents bacteria from producing acids that cause tooth decay. Kids are going to want to eat their candy once Trick or Treating is over. Many families have their children make piles of their Halloween candy on the dining room table in order to check it for safety reasons. It’s important to know that not all candy is created equal. Hard candy can be more detrimental to teeth because it lasts for a long time, which bathes your child’s teeth in a bath of sugar. Really gooey and chewy candy – like caramels – stick around on the surfaces of teeth and gums, which can lead to more cavities. Candy that melts fast and doesn’t hang around leaves little residue that can be easily brushed away. During the process of sorting candy, it might be a good idea to keep your kids focused on the candy that melts faster, and offer glasses of water or milk for them to drink while eating their candy. It might also be a good idea to trade your kids some xylitol candy from your personal stash with some of their hard or sticky candy varieties. 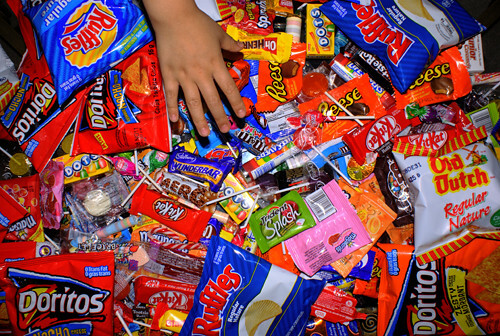 Once Trick or Treating is over, Halloween candy can linger for days on end. This makes it really easy for everyone in your family to graze on it, which is bad for your teeth and overall health. Protect your family from Halloween candy by setting limits on how it is eaten. Create guidelines for eating Halloween candy. For example, have your children choose 10 pieces from Trick or Treating and then donate the rest, or keep the candy stash for one week in which kids can have a piece of candy after meals. Good dental care, however, can be taught both during and after Halloween night. Complete the Halloween fun with a bright, colorful toothbrush that kids can use with fluoridated toothpaste once their share of candy has been consumed. You also might want to visit Portland Oregon dentist Dr. Todd Beck and Dr. Jacob Morrow for a teeth cleaning and exam to make sure all of the candy residue is cleaned away. Call 503-841-5658 to make your personal appointment at South Waterfront Dental!